This is not part of my Amsterdam Museum series, primarily because it’s not in Amsterdam. But it fits roughly in the spirit. Photos weren’t permitted in the exhibition, so pictures here are taken from other sources. Click through for the originals. Bosch produced many paintings, some of which have been partially or fully lost over time, but a good number of which still exist. His style is an interesting mix of realistic and fantastic, and often would suit quite well as illustrations for some alternate-world Lewis Carroll type story. Where things are perhaps a bit more ribald, and horrific. Broadly speaking, his themes tend to be religious, specifically showing how mankind’s current follies are dooming him to hell. Perhaps his most famous work is The Garden of Earthly Delights, which is a triptych that begins showing the biblical account of creation, has the large centrepiece illustrating — somewhat graphically — human vices, and the final part being a Book-of-Revelations style last judgement. I’m not remotely qualified to explain everything that’s there, but there is an excellent interactive exploration of it elsewhere on the internet. The exhibition contains approximately a hundred works (not all from Bosch himself) and things to see, along with a handful of videos, some showing closeups of the paintings, and a couple talking about the famous works. When you enter, you take a booklet in your language and then just follow the path in order, reading the detail from booklet as you go. This way, they can easily cover a multitude of languages. There is also an audiotour available, but I didn’t get that. It is well laid out with an easy path to follow, which is good as it is pretty solidly busy. This first section, known as The Pilgrimage of Life is Bosch’s paintings dealing with everyday life, and the traps and pitfalls placed in your way by the devil. 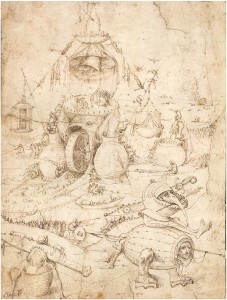 Following on from this, around the middle, it has a section covering his drawings, of which there are 19 in the exhibition. One of these, Infernal Landscape is a relative unknown and is being shown for the first time in public. The final two sections are The Saints, where he paints saints in various situations ­— in particular, his namesake, Saint Jerome — and The End Times, where he decided that the previous set of paintings hadn’t had enough terrible happenings, and some more were needed. 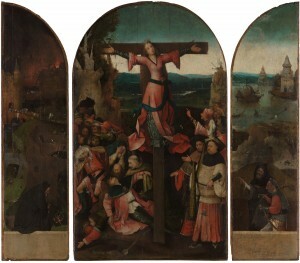 A number of the works in the exhibition are not from Bosch, but came from followers or contemporaries. 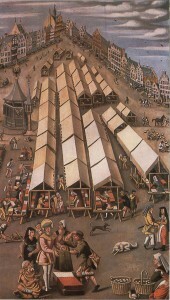 One of these that I quite like is The Cloth Market at ‘s-Hertogenbosch, as it’s a depiction of daily life in the city at the time. Of course, in addition, it’s also a religious painting as the patron saint of cloth sellers, Francis, is distributing cloth to the poor. Should you be fortunate enough to attend the exhibition, there is a smartphone app that will give you some additional information. Scroll to the bottom of the exhibition page to find it. As of the day after I got my tickets, all 380,000 tickets have been sold so you’re probably out of luck if you want to visit. Cost: €22, or €10 if you have a Museumkaart. Sold out though. Language: A tiny number of things are in only Dutch and English, virtually everything is from the booklet which are printed in many languages. Location: 10 minutes walk from ‘s-Hertogenbosch Centraal Station. Hours: 9am-11pm every day until the 8th of May. If you can find a ticket.